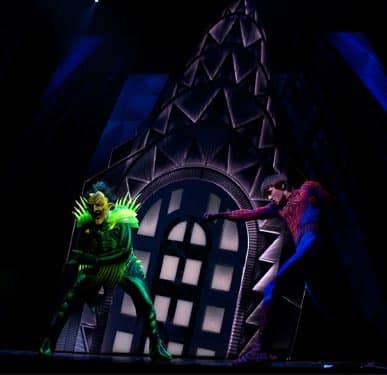 Spiderman the musical is one of the biggest shows on Broadway in New York at the moment. 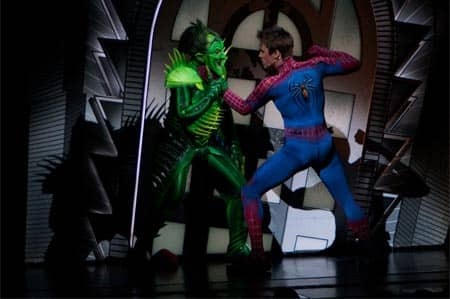 “Spider-Man: Turn Off the Dark” (as it’s officially called) is much more than a musical, it’s a spectacle. Named as the most expensive musicals to produce, it brings to life the comic book hero Spiderman and his sweetheart Mary Jane. And of course not to forget his archenemy the Green Goblin. In terms of entertainment you really get your money’s worth! 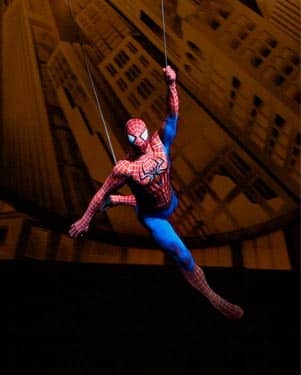 Spiderman is unlike any other musical on Broadway – the lyrics and music were composed by Bono and The Edge from U2. Bono and The Edge have received 22 Grammies over the course of their career and seeing Spiderman is a must for every U2 fan. Peter Parker is an absolute geek: extremely smart but incredibly dorky. His life, however, changes drastically when he is bitten by a genetically modified spider while on a school trip. Gone is the geek! Peter discovers that he has spider-like powers and after getting back at his high school bullies, he decides to put them to good use. But with great power comes great responsibilities. The press brand Spiderman as a vigilante and the Green Goblin wreaks havoc with Manhattan. In short, there is a lot that Spiderman has to deal with. The sets of Spider-Man: Turn Off the Dark are truly magical. They bring the comic book to life and at times have you believe you have been transported to an alternative Manhattan. Spiderman wouldn’t be Spiderman if he didn’t fly around using his web shooter. So experience Broadway like never before with flying characters, aerial combats and tons of live action. But you are warned: do not try and catch a lift with Spiderman! Simply sit back and enjoy the thrill of the show. Tickets for Spiderman sell out quickly, so be sure to book yours beforehand here. Note: The tickets are cheaper than other websites and even the box office because you do not know the exact seating before you book.